~ This site will help you understand the process of installing wood flooring products, such that you will be able to make educated choices and decisions concerning this procedure. It will also help you communicate to your wood floor contractor/retailer and installer when having this work performed in your home. Included herein are the Industry accepted standards for Installing Wood Floor Products with procedures from the National Wood Flooring Association (NWFA) Hardwood Flooring Installation Manual. Our site is simple and to the point ! Hardwood Floor Information, Links (some to our affiliated sites) & Directories to help you make an informed decision concerning this specialty flooring product. Site navigation is easy. Use the header atop each page for site directory or our most popular pages in a directory at the bottom of each page. NOTE: Some links at this site link directly to our affiliated sites. We appreciate your visit. 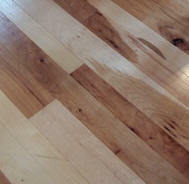 NOTE: Any wood floor installation should be done by a qualified wood floor professional. This is NOT at DIY project. The information here is to simply help you the consumer understand the process. Wood Floors are an INVESTMENT, and add value to your home, thus decisions concerning them should not be taken lightly. Seek a wood floor professional, with an established business, reference list of satisfied customers, and a port-folio you can view past work. Wood Floors are a beautiful and natural product that sets it apart from other floor coverings. The ultimate appearance and performance in any application, however, are dependent upon the installation and finishing process, with close attention by the installer and finisher to a number of details prior to and during the actual installation and finishing process. It has taken many years of practical experience to describe the simplest methods of achieving successful finishing of various types of hardwood flooring. This information is generally applicable to the installation of most hardwood flooring products. With today's technological advances, in regards to finishes, techniques and finishing equipment, we will attempt to help you understand the many steps involved in the installing of wood floor products as the accepted methods used throughout the Wood Floor Industry.